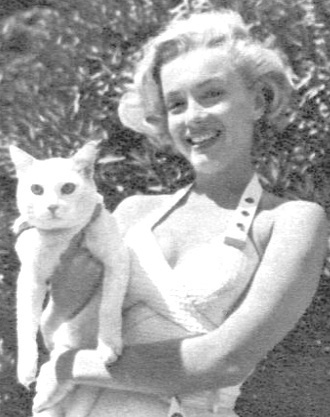 Marilyn with a cat. She had 2 cats.One of them was called Mitsou <3. Wallpaper and background images in the 玛丽莲·梦露 club. This 玛丽莲·梦露 photo contains 小猫, 小猫小猫, 汤姆, tomcat的, tom, tomcat, 汤姆 tomcat, 皮肤, 肤色, 裸色, 偏下体, 暗示裸体, skintone, 部分裸体, 隐含的裸露, 部分下体, and 隐含的裸体. There might also be 猫, 猫真, 真猫, 真正的猫的猫, 比基尼, 两件泳衣, 泳衣, 比基尼泳装, 两件套泳衣, 泳装, 游泳衣, 泳衣, 游泳服装, 泳裤, and 浴场服装.